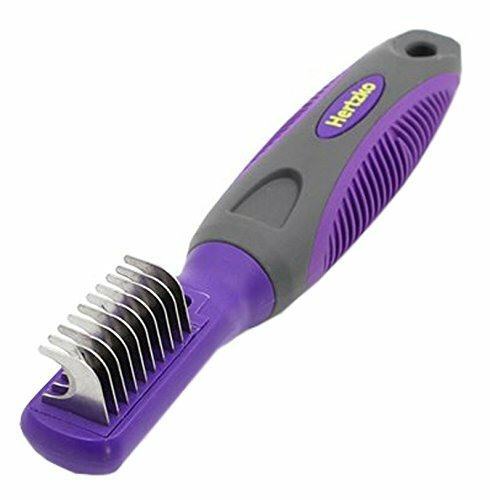 ★ THE BEST TOOL TO REMOVE TANGLES, KNOTS, SHEDDING, AND MATS – Hertzko’s De-matting Comb gently removes Loose Hair, and eliminates Tangles, Knots, Dander and trapped Dirt. 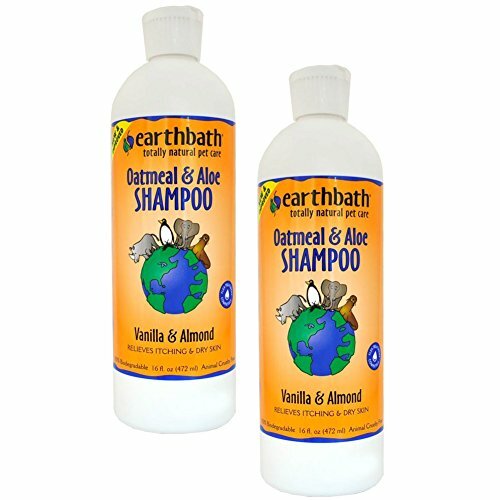 WORKS GREAT ON DOGS AND CATS WITH ALL HAIR TYPES! 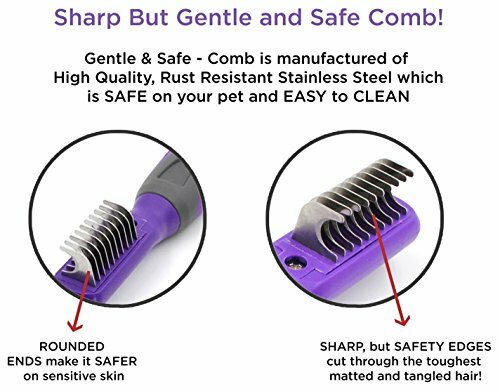 ★ NO-SCRATCH TEETH – Our Comb is designed with SHARP TEETH which prevents pulling hairs, and the FINE CURVED ENDS makes it safe on your pet’s skin. 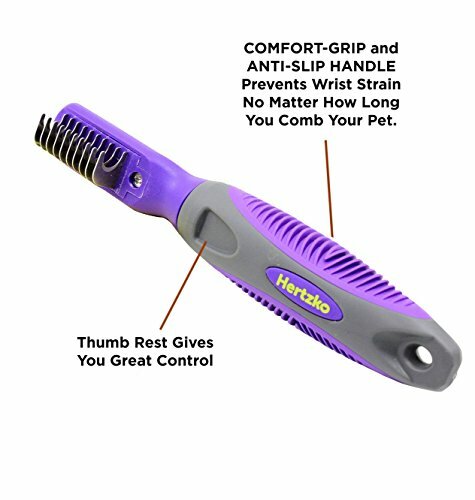 ★ COMFORTABLE, STRONG, AND DURABLE – Our Comb is especially designed with a COMFORT-GRIP and ANTI-SLIP HANDLE, which prevents hand and wrist strain no matter how long you comb your pet! All-In-One Dog Cat De-matting Tool – for Long, Medium, Thick, Wiry, or Curly Hair. ★ Get rid of dead and knotted hair- our Comb gets through the thickest coats and prevents tangling and matting. 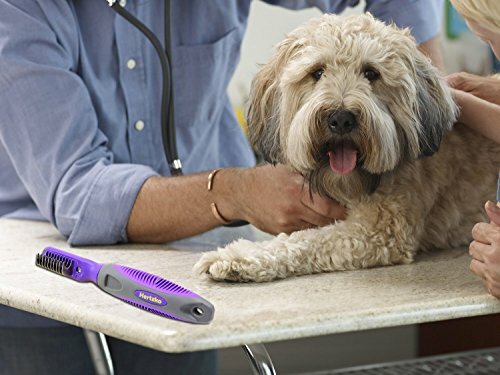 Make Combing your pet A Comfortable and Pleasant Experience- Our Stainless Steel Blade De-matting Tool grooms and massages for a healthy coat, increasing blood circulation effectively. It is designed with Sharp Teeth which Prevents Pulling Hairs, and the Fine Curved Ends make it Safe on Sensitive Skin. Our sharp, but safety edges cut through the toughest matted hair ! Even after the first use, you will notice that your pets hair is much sleeker, and your pet will feel and look great too! Get the Hertzko De-matting Tool today. You will not regret investing in high quality products. Click the Add to Cart button now and treat yourself and your pet by getting the Hertzko De-matting Tool TODAY! ★ YOUR PET WILL NOT ONLY ‘LOOK’ GOOD BUT ‘FEEL’ GREAT TOO! 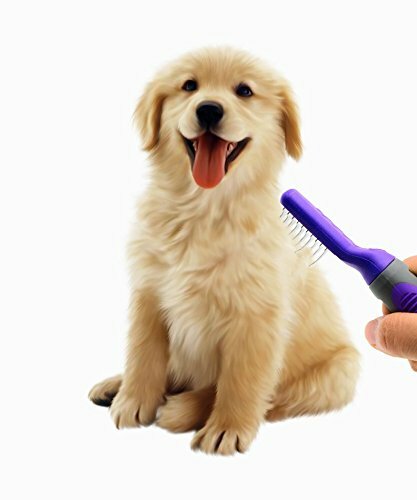 – Our Comb Grooms and Massages for a healthy coat, increasing blood circulation and leaves your pet’s coat soft and shiny. Your Pet will love being combed! ★ YOU CANT GO WRONG WITH THE HERTZKO DE-MATTING TOOL -We offer 100% Satisfaction Guarantee!